COLUMBUS, Ohio (AP) — Student employees at Ohio Dominican University’s Computer Helpdesk are putting away the electronics to knit hats and scarves they plan to hand out to homeless men and women. Their goal is to have 500 items to donate by Thanksgiving and Christmas. They may work in technology, but whenever they have some downtime, student employees at Ohio Dominican University’s computer help desk happily put away the electronics. Instead of idly scrolling through their phones in between service calls, they pick up a round loom and some yarn and start knitting. Theve, who is from Grove City, is one of eight student employees at the help desk who actively knits hats — and sometimes scarves and blankets — that they plan to hand out to homeless men and women in the fall and winter. The effort began in December when Noelle Lines, Ohio Dominican’s assistant director of Technical Services, talked to the students about her love of knitting. One day, Lines brought in supplies and sat with them during breaks to teach them the craft. All told, it took about just 20 minutes for them to pick it up. Many of the students continued with the hobby during their winter break — Theve, for instance, said she knitted several hats as Christmas gifts for friends and family — so when they returned to campus, they hatched a plan. Lines said she often sees homeless men and women around Galloway, where she lives, so she asked the students if they’d like to knit warm items for them to protect them from the cold. The students’ enthusiasm for the cause immediately was palpable. The group set a goal of 500 hats that they plan to start handing out in person around Thanksgiving and Christmastime. However, it’s a target that Lines said she fully expects them to eclipse after the students took to the initiative with a zeal she could never have anticipated. Already they have about 80 hats, scarves and other warm items of various hues and patterns. The students not only work on the hats during their breaks at work, but between classes and even at the end of the day when they’re at home. On a recent day, spools of yarn of varying colors were splayed across a table in Lines’ office as four of the students cheerfully worked on hats. Piled in the corner were the fruits of their labors thus far. Lines provided the looms and restocks most of the yarn with her own money, making it all accessible to the students in a box outside her office. But the students as well often venture to a nearby Michaels craft store to buy their own supplies. The creativity that comes from experimenting with a variety of colors and designs is part of the fun, they said. Vance estimated that it takes anywhere from 30 to 45 minutes to complete a hat, depending on the size. The students said their time spent knitting is often meditative, a welcome respite from the stresses of school. “I’d rather be knitting than doing homework,” Vance agreed. The charitable component is also motivating. Most of the students have volunteered their time to worthy causes in the past — Caruso with his church, Vance with the Fairfield Area Humane Society and Theve with the Buckeye Ranch, which provides mental health services for children and families. Even though Caruso graduates in May, he said he plans to join the others when they venture into central Ohio neighborhoods to hand out the items. And despite the amount of hours they’ve put into the products, the students say it won’t be hard to part with them. 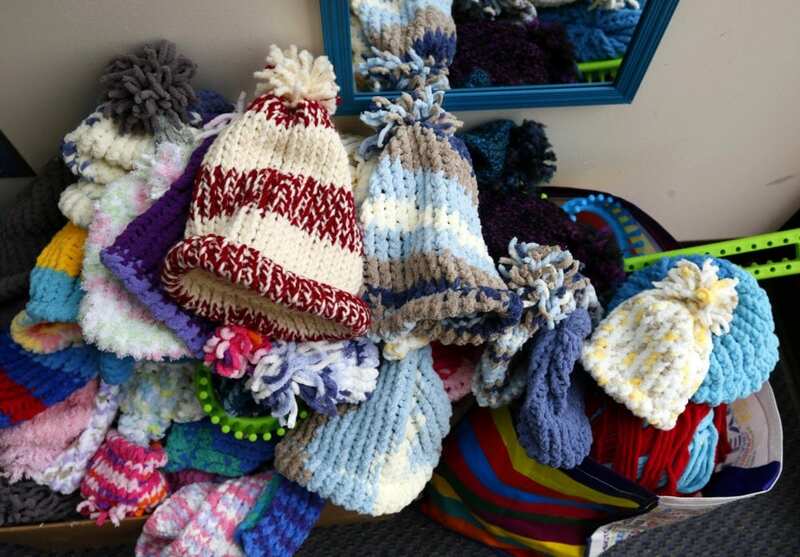 Be the first to comment on "Ohio Dominican Students Knit Hats, Scarves For Homeless"